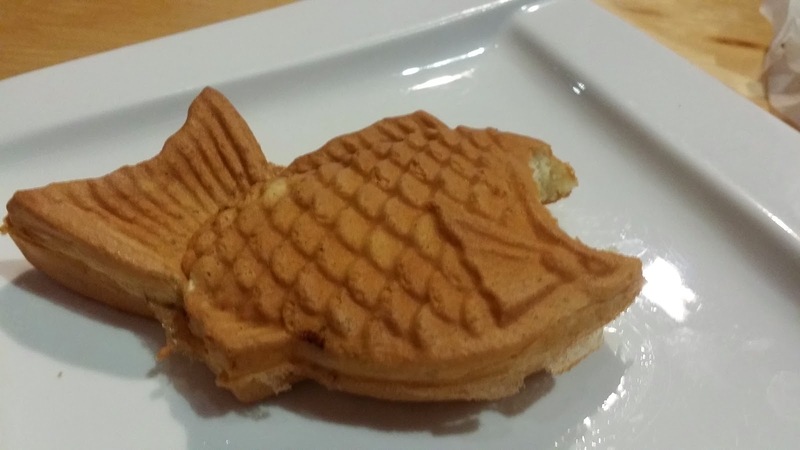 JAPANESE CREPE & TAIYAKI @ GENKI LIVING - GARDEN GROVE (CLOSED) - EAT WITH HOP! 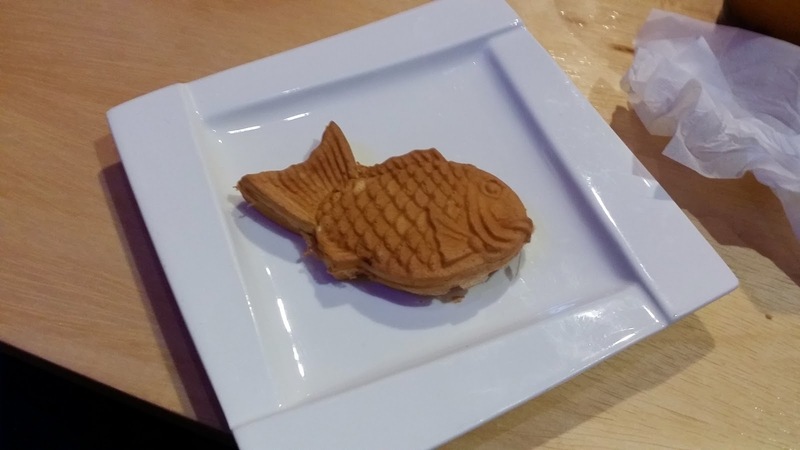 ONE OF MY FAVORITE JAPANESE STREET FOODS: THE TAIYAKI. 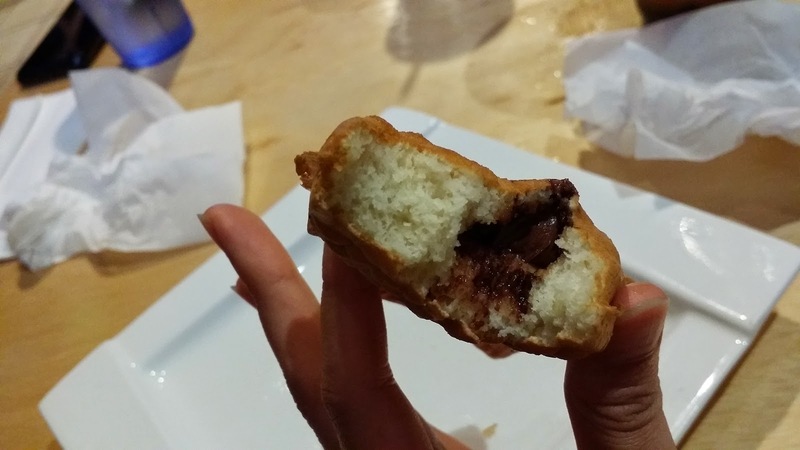 THIS ONE IS FILLED WITH NUTELLA! DO YOU SEE THE NUTELLA? IT'S MOSTLY FLOUR AND A BIT OF NUTELLA IN THERE... HAHA BUT YUMMY! 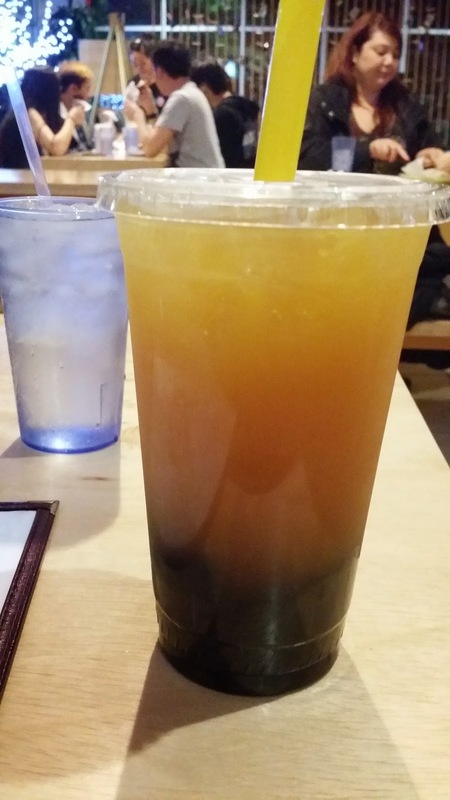 PEACH GREEN TEA WITH BOBA. THE BOBA WAS CHEWY AND SOFT! DAMN, THEY HAVE PRETTY DARN GOOD HAPPY HOUR DEALS!! 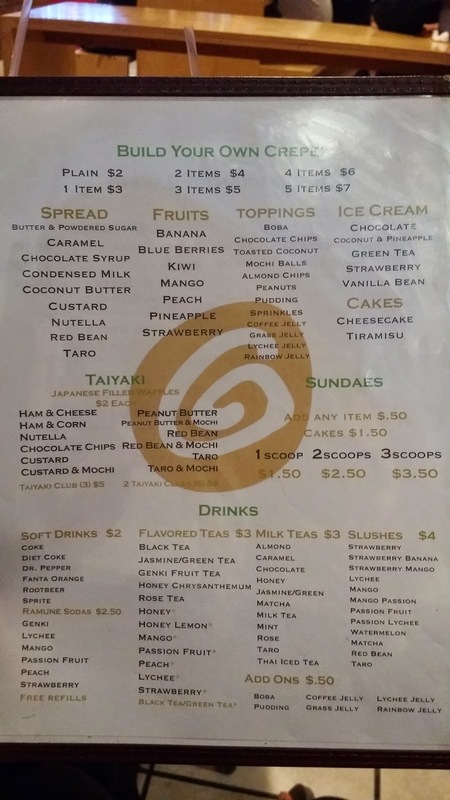 THE PRICING IS NOT TOO BAD BUT DEFINITELY NOT A CHEAP DESSERT! MY CRAVINGS WERE NOT SATISFIED BECAUSE HONESTLY, I CAME HERE EXPECTING TO EAT A DELICIOUS, CRUNCHY, SWEET, THICK HONEY BRICK TOAST. 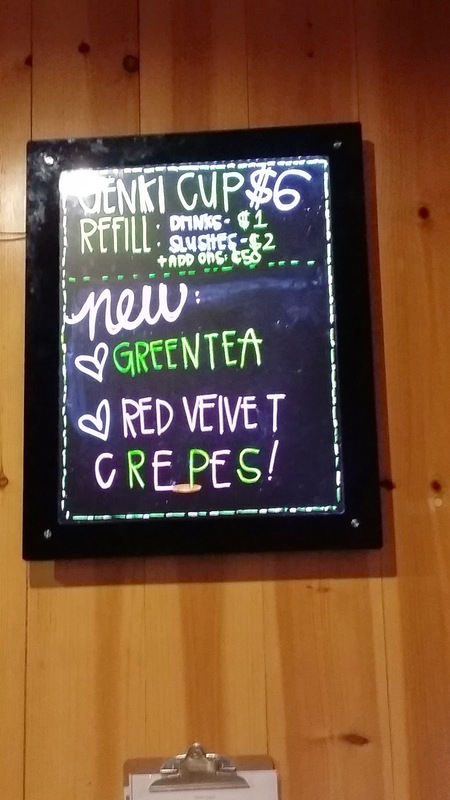 HOWEVER, AFTER SCANNING THE MENU METICULOUSLY OVER AND OVER HOPING THAT THOSE WORDS "BRICK TOAST" WOULD JUST MAGICALLY APPEAR, I GAVE UP AND JUST ASKED THE WAITTRESS. OH WELL...BECAUSE THEY STILL HAVE OTHER DESSERT AT LEAST! Okay, enough of caps lock! Hah! 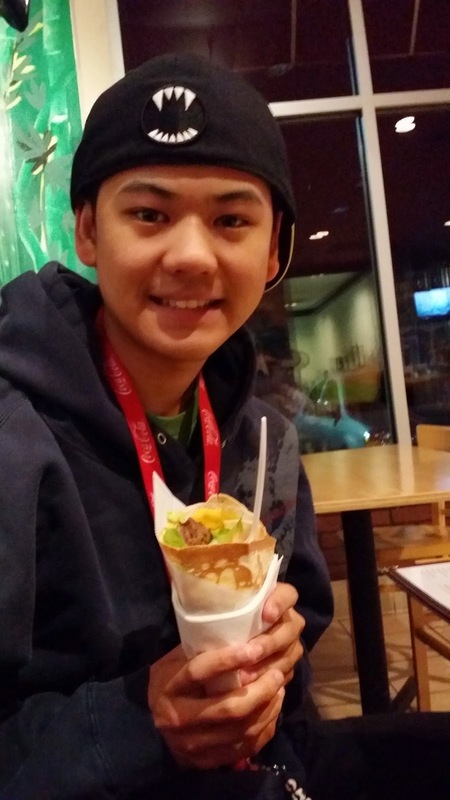 Kev and I ordered a cheeseburger crepe and a nutella taiyaki. As for a drink, I got a peach green tea with boba. Everything was satisfactory but the service was a bit slow. 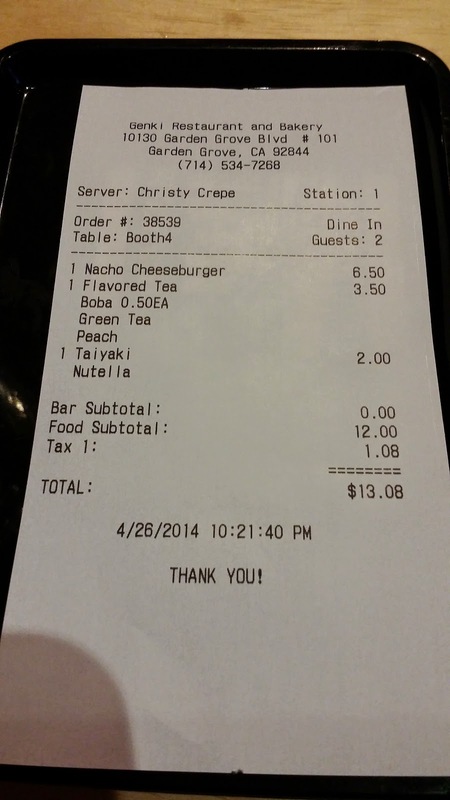 I honestly felt bad for the server/waitress because she was the only one taking orders and it was pretty busy. At least the food didn't disappoint us though! 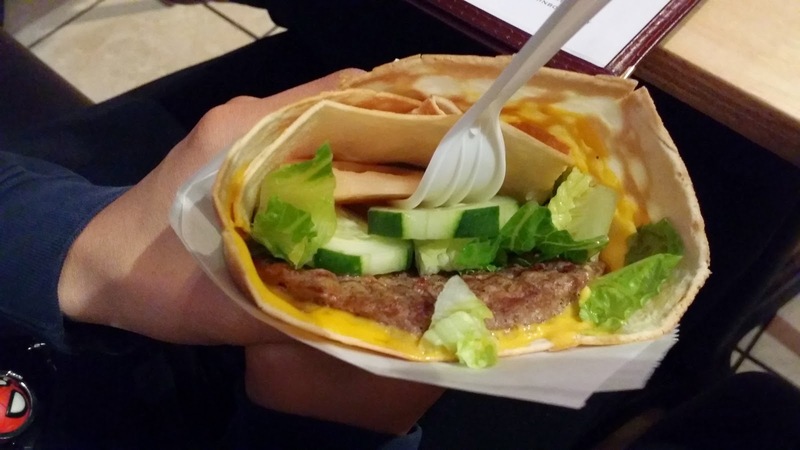 The Cheeseburger Crepe was wrapped with a very crunchy yet soft at the same time crepe. The filling was what made it basically a meal more than a dessert. 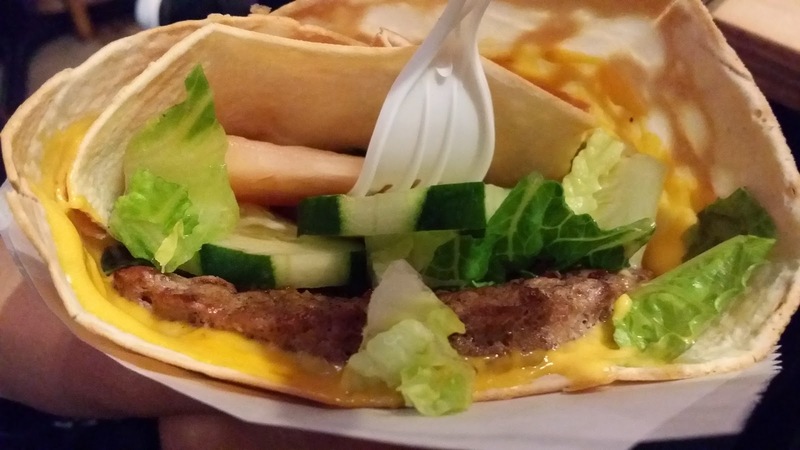 The burger patty was thin and not the juiciest of patties but it was good for what it was. I really loved how the tomatoes and cucumbers made it taste refreshing and the melted cheese that spread over the crepe made it even better. We finished it thinking man, this was good! 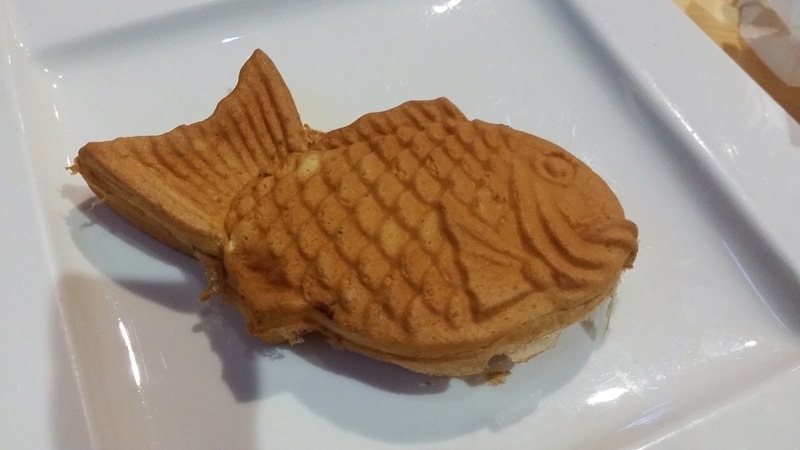 The Nutella Taiyaki is pretty much a cake/bread type dessert shaped like a fish with filling inside. It's mostly mostly flour and a bit of filling but I love the fluffiness of the flour. YUM. 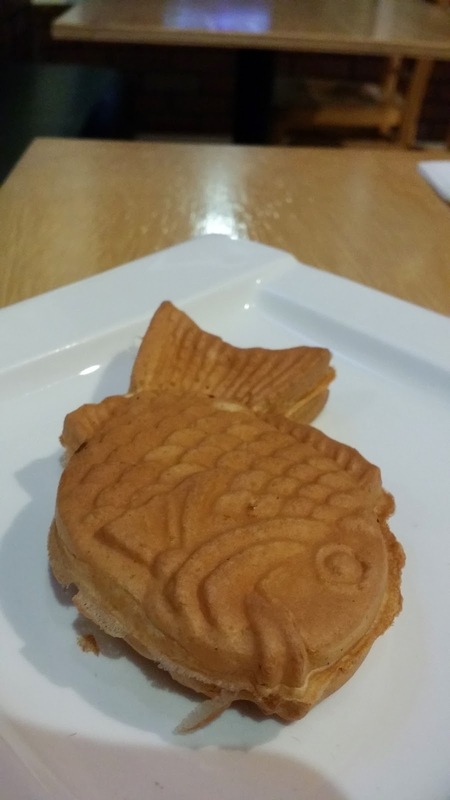 This made me feel all nostalgic and want to go back to Japan and Korea and eat those chocolate/vanilla/green tea/red bean flavored creme filled taiyakis sold on the streets. 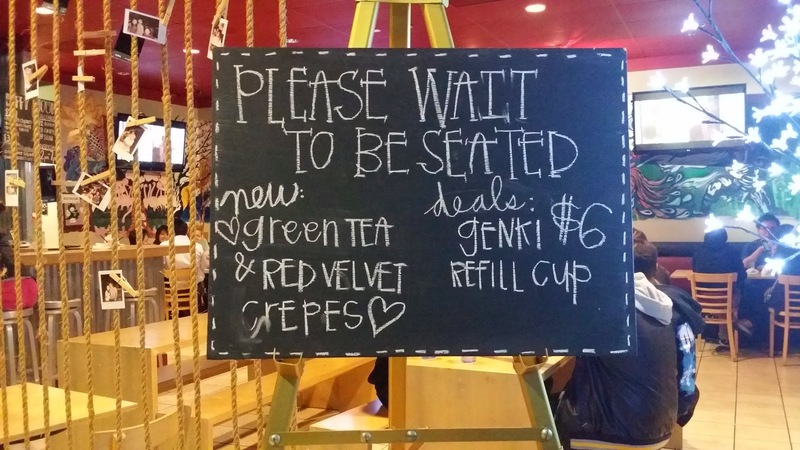 The Iced Peach Green Tea with Boba was delicious but nothing too special. The boba was cooked to my liking: soft and chewy. 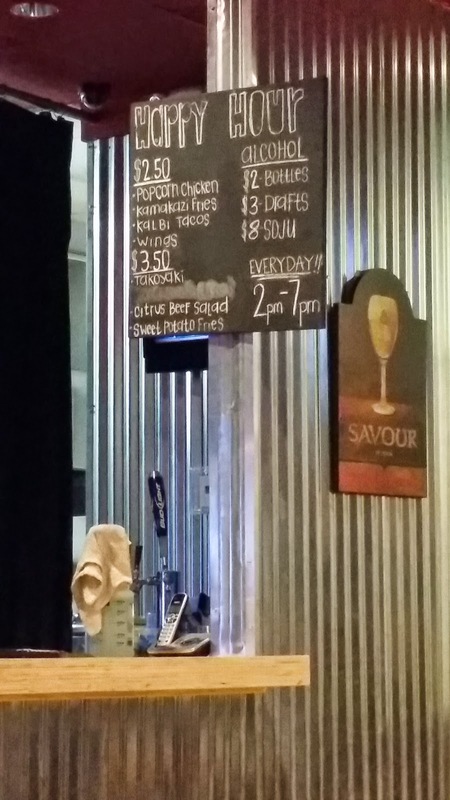 Apparently they also have kogi tacos and buffalo wings here. Even alcohol is served too! This place used to be one of my favorite crepe places in high school and it would have pretty long lines out the door too with a unique vintage decor that included an old fashioned arcade gaming system and other cute knick knacks. 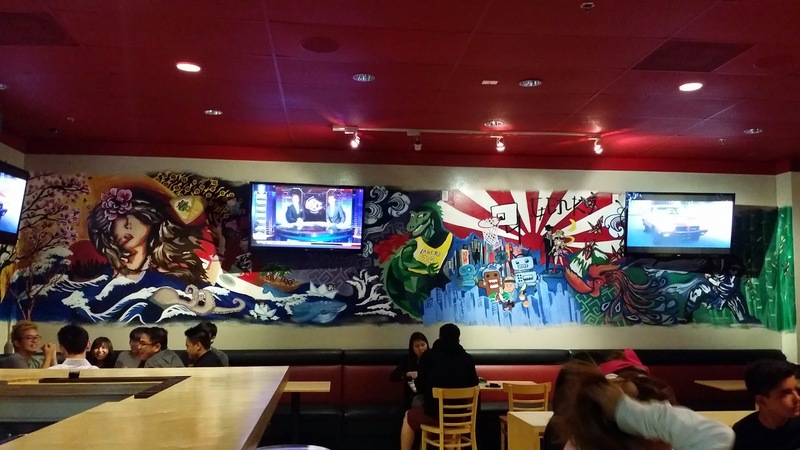 However, they then expanded the store (moved it 2 stores down in the same plaza) and expanded the menu to include the beer, the various entrees that they had, and much more dessert. I guess it didn't work out for them which is why they have totally cut out so many things from their menu (like the brick toast I ever so wanted to eat and craved for!) 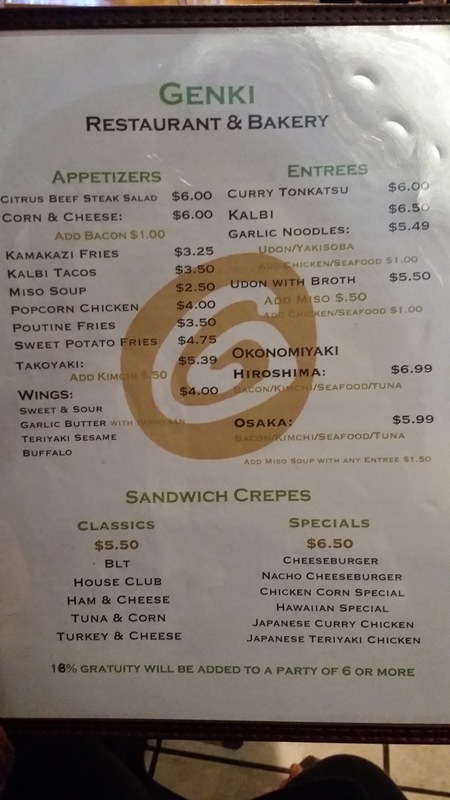 so I was pretty surprised when I went to this Genki Living restaurant to find that their menu is now only one double side page. It used to be like 6 double side pages! Will I go back here again? YES. BUT PROBABLY ON A TUESDAY. 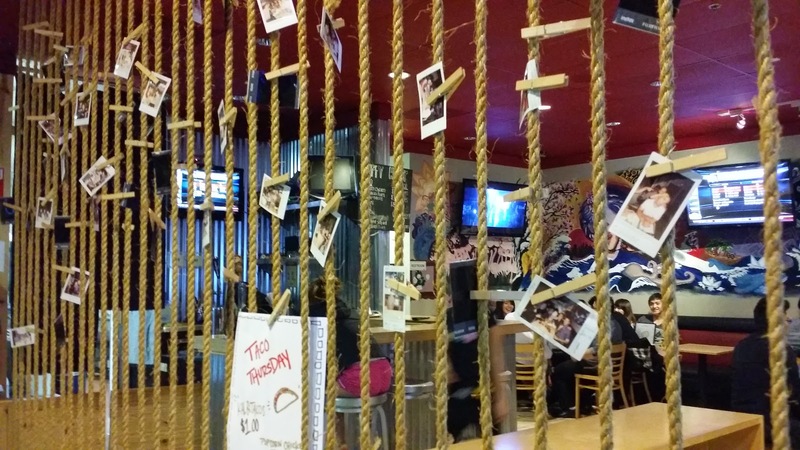 I wanna try there $1 kogi taco tuesday deals!